The me I show to the world isn’t always the same as the private me. I know that, sometimes, people who think they know me, suppose my life is one big idyllic bubble. All baking and babies and countryside and long grass through which to trail my fingers. And that is indeed part of my life, especially since our lawn mower breaks down often. But it’s also because I don’t always choose to share the more negative parts of my life publicly because I like to see the best in everything and I like to spread joy and comfort; not worry and misery. I have this memory of being very young and being in the playground at primary school. I sometimes found playtimes hard but pretended, largely, that I didn’t. Mostly they were okay but not my favourite time: too disorganised, too sprawly and I didn’t have a best friend til way, way later with whom to buddy up. And then I remembered that Kizzy was on that afternoon and I got this surge of happiness (it was to be 30 years before I realised it was actually a surge of a hormone called oxytocin and for ages I thought I was the only one who experienced these physical surges of happiness). And I realised, right there and then, that life was about a series of episodes; pockets of good things and bad things and if you could just concentrate on the good things, the bad things could diminish. Mostly. And that Kizzy moment has never left me. This week a much loved colleague from my years at the Independent on Sunday, died. She was also a friend that I’d known for twenty years. Someone that I hadn’t spoken to in a while, because I took it for granted that she’d always be there to catch up with. As you do. I won’t say anything else about her or what happened to her, because it will probably just make you anxious and think the world is a big, scary, place. And it isn’t. It’s mostly really good. Clare read this blog avidly, although she never commented. Even in her last message to me just last Saturday she said “I’ve really loved your blog”. Because I can’t be absolutely sure that you can’t read the internet when you’re dead (I mean, come on, who knows?). I’m giving her a shout out here. Clare was a hopeless romantic and we shared many cosy, chatty evenings at her house in Crouch End when she lived in London. This is just the sort of tart we’d have made because it would have been lovely, and shown caring and thought, but not distracted us too far from the task in hand: putting the world to rights. So here is an easy tart. Although usually, because I am a crashing, crashing snob about home made things, I would never entertain the thought of buying a home made pastry case, sometimes, it’s okay to. Buying the pastry case for this makes this so easy. And yet the result is glorious. I’ve put it here, today, because there are so many berries being picked right now and this is a lovely way to use them. It will make you feel good making it and even better eating it. You need a ready made shortcrust pastry case, about…8 or 9 inches? They’re pretty standard size in the supermarkets. Meanwhile, make the syrupy topping which you do by putting the caster sugar and two tablespoons of water in a pan over a low heat. Let the sugar dissolve, increase the heat to boil for a few minutes (2-3). Remove from heat and add lemon zest. Cool completely. When ready to serve put the berries on top (I find them nicer at room temperature), pour the syrup topping over the whole thing and serve. This entry was posted in Patisserie, Pudding, Teatime and tagged berry tart, lemon curd, mascarpone, pastry, using up berries on August 25, 2013 by Annalisa Barbieri. My jam tarts. The orange ones are apricot jam, the darker yellow ones are the Duchy Originals lemon curd, the bright yellow the Waitrose lemon curd. As I look at the list of things I’ve written about on here recently, I see it’s a lot of food stuff. 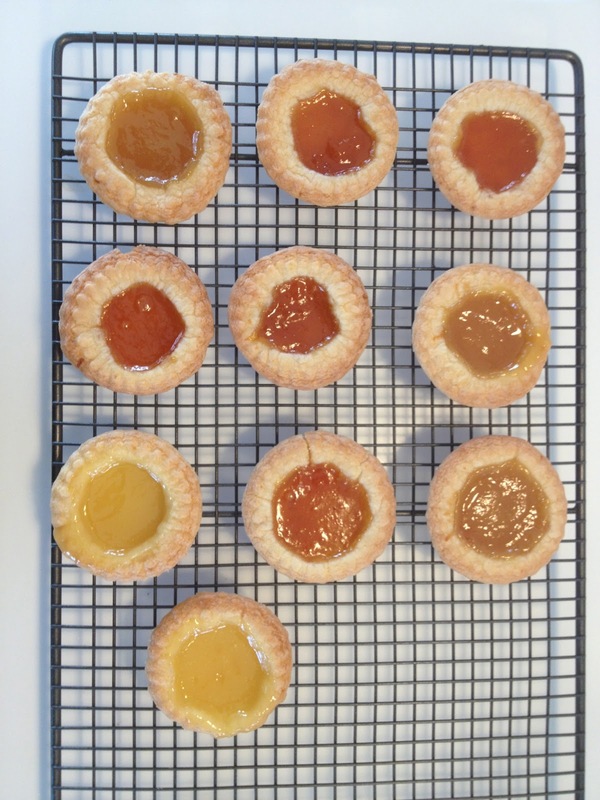 Jam tarts. I don’t often eat them, because the shop bought ones are like cheap jam spread on layers of newspaper. But they seem so easy to make. Except the last time I made them, they were a disaster. It’s too long ago now to remember what happened. On Thursday I was looking through my recipe books, deliberating what to cook for Sunday lunch (I menu plan in a fierce way, this keeps spending under control and I can also make sure we have a good balance of food during the week in terms of ‘have we eaten enough fish?’ etc. You can hate me if you want, but I AM that organised). I skimmed through Jamie Oliver’s Best of British and found a recipe for jam tarts that didn’t just say “shop bought pastry, jam”, so I tried them. They were delicious, a bit superior in fact. The pastry is chewy. Jamie says to use all different coloured jams, and I’m sure that’s a great idea if you like a rainbow effect on the serving plate (he does indeed call them “Rainbow Jam Tarts“, p. 178 of Jamie’s Best of British). But I found that, in reality, some are more popular than others. And let’s face it, no-one likes a green jam tart. My children really liked the apricot jam ones. Me and their father shoved down the lemon curd ones as if we were trying to hide evidence. A word about lemon curd. I used the Duchy Originals one and the Waitrose own make. No comparison. The former was vastly superior, a darker colour (more natural looking), a far nicer taste: rounded and subtle, the Waitrose one was too sharp, ringing that “I’ve got lemons in me” bell a little too shrilly. The curds also acted differently in cooking. The Waitrose one exploded out of the tarts, the Duchy one was all well behaved and stayed put. For the filling you will need a heaped tablespoon of your favourite jams or curds. You need a jam tart tin, which is to say one of those shallow 12-hole tins. Not a deep one like you’d use for muffins or cupcakes. The sort you’d probably make mince pies in. I greased mine very lightly. Now, put the flour, sugar, salt and butter into a food processor and pulse until like breadcrumbs. Although in truth because there’s so little butter to dry ingredients, this will look more like what it is: lots of flour and sugar, rather than breadcrumbs. Crack in the egg, grate in the zest and pulse again, adding just enough milk to bring it all together. You’ll have a soft dough, flecked with zest. Rest it in the fridge for at least 30 minutes, or until you’re ready to use it later. Now preheat the oven to 180. Dust a surface with some flour, roll out the pastry to about 0.5cm thick (don’t make it too thin or they will collapse when cooked as they’ll be too thin to take the weight of the filling) and cut with a fluted cutter to a size bigger than the holes in the bun-tray. Place each circle in, gently push down. Then add tablespoons of the jam/curd in: about one heaped tablespoon per tart. Don’t overfill but don’t be mean with it either. About half a cm below the top of the pastry shell should do it. Now, gently spread the jam/curd around so it lies flat and fills the shell. Don’t just leave it in a blob as fell off the spoon as it won’t spread out whilst cooking, the pastry rises to fill the gaps and you’ll end up with something less than perfect looking. Put into the oven (you may need to cook in batches if you only have one tray, but that’s okay cos the pastry can sit in the fridge for a day or two). Cook for 12-15 minutes. You want the tarts golden round the edges. Leave in their tray for a few minutes before prising out. Mine came out quite easily although the ones with the lemon curd were the hardest to take out. The ones with the Waitrose lemon curd in were the hardest of all and broke up quite easily (I am never again buying this lemon curd). If it interests you, these are also really easy for children to make. I didn’t let mine near it as it was my self-soothing project. This entry was posted in Celebration, School fete, Tarts and tagged jam tarts, pastry on February 4, 2013 by Annalisa Barbieri. 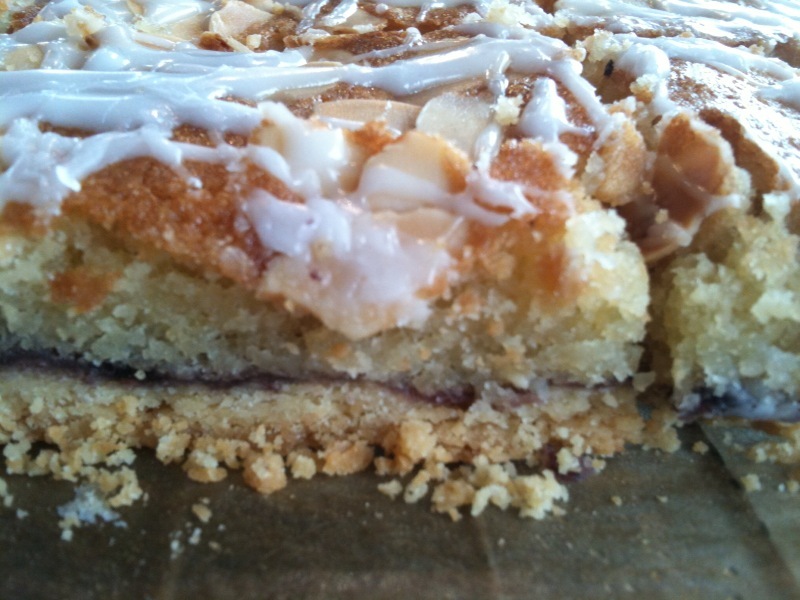 The Bakewell slab, before it was liberated into slices. Please note how crumbly my pastry is thanks to my super cold heart and hands. We went to Southwold at the weekend, and central to this, central to most trips in my life, was a picnic. We had everything other than something treaty to take with us (like sourdough bread, home made coleslaw and pork pie aren’t treat enough, spoiled bastards that we are). I had some ground almonds I wanted to use up and decided to make individual little clafoutis, until I found out that mostly the recipes I had for clafoutis didn’t really involve ground almonds and anyway I didn’t have enough cherries. But I did have a can of ‘black cherries in syrup’ and lots of ground almonds. I make a really superb (look, there’s no immodesty in the truth) Bakewell Tart, the recipe for which came from the Waitrose magazine long ago. Believe me when I say you don’t need to search for any other bakewell tart recipe as the Waitrose one cannot be beaten. But I didn’t want a bakewell tart. I wanted little individual things to pick up. So I thought: bakewell slices. (you may also need a bit of extra water). I whizz the flour, sugar and butter in my Magimix, then add the egg yolks and a bit of water if necessary. Don’t overdo it with the water and try to keep the pastry so that it’s just holding together, it shouldn’t be all smooth and one big ball. If you haven’t got gadgets of course you can do this with your fingers and then use a fork to mix the yolks in or something. I don’t know, it’s ages since I didn’t have gadgets. I never roll out pastry. Life is too damn short. It’s not too short to make your own pastry though cos shop bought really isn’t the same and how long does it take to weigh out a few ingredients and slam them in a blender? When it’s blended, I just take bits of the pastry and flatten it out into the bottom of whatever tin I’m using, welding it all together with a thumb like a giant pastry jigsaw. In this recipe I used a small Mermaid roasting tin which is about 30cm by 23cm. I lined it first with baking parchment/paper. Then when you’ve covered the bottom of the tin with pastry in this piece meal but completely acceptable fashion, chill the pastry for about half an hour (perfectly do-able to chill for longer of course). In the meantime, preheat the oven to 190C. When the pastry has rested, cover with foil, pour on baking beans (sorry, apparently you can use rice too, never tried it, I’ve had baking beans since I was seven, I’ve always been very serious about pastry). Bake blind (this means with nowt in it but the baking beans on the foil) for 15 mins. Then remove the beans (take care they’ll be hot) and bake for a further five minutes. Now I have a problem with jam. It’s just too damn sweet. The only shop bought jam I really like is Bonne Maman’s apricot conserve, although I can’t eat the chunky bits of apricot as they scare me. When I make my Bakewell Tart, I use strawberry jam, very thinly spread. But I had that can of black cherries in syrup that I was determined to use up. So I poured the whole contents of the can into a saucepan and boiled it until it was mush. This takes about 10-15 mins. It makes for a really nice fruity layer which isn’t too worthy (it has got syrup in it after all) but isn’t as teeth-jarring as jam. *See note at bottom. Just use jam or compote if you don’t have cherries in a tin. Mix the butter and sugar together until it’s light and fluffy, this is quite a good work out for your arms and you’ll expend about 12 calories to offset against the calorific value of these slices, then add the eggs, one at a time, mix well, la la la, then the almond extract and finally fold in the ground almonds. Spoon the black cherry mush onto the pastry case, then on top spread the topping. It looks like you might not have enough but unless you’re using a giant tin, in which case you haven’t read my instructions, you’ll be fine. I also like to top it all with flaked almonds, like a handful scattered on top. You can never have enough almonds, rich in protein (so they bring down the GI of anything), calcium and essential fatty acids. How can you go wrong. Unless you’re allergic to nuts of course. Cook for 25 mins or so, the top should be definitely golden, not pale blonde. When out, tie your hands behind your back and dive in face first. Or alternatively, slice into Mr Kipling type slices, big or small depending on what suits your psyche. You can also drizzle some icing on in that fancy filigree way (50-75g icing sugar with a few teaspoons of water, do it slowly so you have a fairly thick mixture, not too runny but not so thick it blobs on). I do like icing, but remember you’re adding on a whole heap of sugar for that bit of icing, so go easy. These keep lovely in an tin for a few days and make lovely treats. My boyfriend cries slightly when he eats one. *update. March 2014. I made these today and I did exactly what it says up there. But. I found that this time, the cherries weren’t enough to cover the base. I’m not sure if the tin was smaller (I don’t think so). I did use a different make so maybe they were just different. Anyway, the point is that I realised that not all tins are equal and I’d hate for you to make this and it not work. So have some jam or compote on stand by just in case, or you know, FORGET THE GODDAMN cherries in a tin altogether and just use jam or compote. It’ll be cheaper, too. This entry was posted in Biscuits, Patisserie, Picnics, Teatime and tagged bakewell slices, pastry, picnic on August 10, 2010 by Annalisa Barbieri.